Ah, the mid 1990s. We used terms like “new media,” and the idea of a record label of sorts devoted to the multimedia CD-ROM seemed natural and futuristic. It was the era of the Voyager Company, a pioneering media firm that spawned the Criterion Collection (via beautifully curated LaserDisc editions of great films), and an interactive line for Windows and Mac. Voyager is a story all its own, but I think Laurie Anderson’s Puppet Motel stands out. 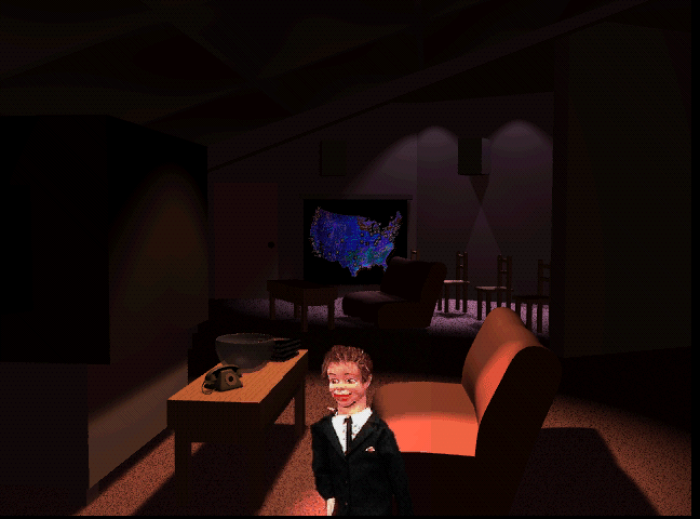 Being led through three dozen virtual rooms by a ventriloquist version of Laurie Anderson finally made me feel like I understood why the computer was invented. But I think I’m not an average person. The breakthrough in technology at the time was that rich media could be distributed to a wide variety of platforms. On the Mac side, this came in the form of newer-generation models and the availability of QuickTime. (It’s actually easy to forget just how radical an invention QuickTime was at the time.) On the PC side, there were somewhat dubious multimedia standards, but a general availability of computers capable of playing video and audio on Windows. And this all coincided with Macromedia Director (born Macromind Director), a deep scripting tool for creating interactive content – one with capabilities that actually exceeded Flash. But that’s just the technical side. It’s the way this capability was received by a handful of forward-thinking artists that’s notable. Perhaps 90s media thinking is the perfect antidote to today’s online media, driven as it is by big data, ads, and mobile-digestible content. In fact, the legacy of the Voyager creation is more on the side of experimental gaming, when users of PCs and consoles are willing to shut off other distractions and immerse themselves. Morton Subotnick spoke about his own contribution to the Voyager line as an opportunity to create a new “chamber music,” to embrace the intimacy of a private experience in the home. The reason I single out Laurie Anderson is that her work felt most at ease with the format. Laurie Anderson’s performance style had already by the 90s matured into fragmentary narratives – bits of stories, interwoven, with poetic slices of phrases added sometimes almost decoratively to more linear tales. In other words, watching Laurie Anderson perform is already a bit like experiencing something immersive and non-linear. Her content was already tailor-made for the format. On a CD-ROM, you can wander and linger and let bits wash over you in any fashion. You can string together those pieces like a performance, almost as Laurie Anderson does in variations on hers. Her tendency in her work to repeat and vary tropes, working over past notes, naturally fits the flow of interactive media. It’s a world you can enter and leave. She was also paired with a perfect collaborator, Taiwanese media artist Hsin-Chien Huang. Huang’s aesthetic perfectly fits Anderson’s – stark, surrealist, contemporary. It’s a world built as an echo of ours, a pastiche made from the component furniture of our everyday landscape, once removed from its expected context. And Huang’s experience in building large scale and mechanical installations gives the virtual world a sense of solidity and impossible realness. And there’s the fact that Laurie Anderson’s work was at the peak of what might be considered a mature style, a combination of spoken word, stories, electric violin, and songwriting, in a collaboration with Brian Eno that filled out the electronic orchestrations. In advance of Anderson’s return to Berlin, I went back and did some quality listening to the album from which most of the material is taken, Bright Red. And I think it’s a weird masterpiece, one that seems oddly resonant and relevant today. There are some “hit” singles in there, mixed with more of these fragments that seem to want to spill off the album and into their own universe. These then make a perfect soundtrack and landscape to the interactive version. There are also bits of the 1986 Anderson short film What You Mean We?, but given her cyclical, iterative working methods, it’s impossible to tell which is which unless you know the material separately. The work is fully digital, but self-aware – media recognizing the demise of the CD, the overload of digital information, and the way in which that would destroy old notions like LPs or linear narrative. The return to Berlin was fitting, as the Transmediale festival celebrated its thirtieth year, and Andersen herself came back to perform in Berlin having presented Puppet Motel at an edition of Transmediale back when it was stilled called VideoFilmFest. Puppet Motel was an early experiment in re-imagining media and learning to swim. Puppet Motel, an arts CD ROM by writer, musician, composer, performer, and photographer Laurie Anderson, is an imaginary universe made up of the interplay between light and darkness, mystery and poetry. This universe is populated by puppets and, of course, its creator, the artist herself. Wandering around the visitor is often tempted to put a story together from the succesive images displayed on a virtual TV screen in a “black jack manner” or from the objects found in a dim lit room but in the end he must realize that he has been chasing after shadows since the CD ROM does not belong to the tradition of the great narration. These three dimensional virtual spaces are crammed with ghosts and secrets: the visitor is constantly taken by surprise. He is trapped, over and over again, by the virtual setting so he must switch off the computer and start again in order to escape. This platonic vale of tears radiates an enigmatical atmosphere which, all too often, appears manneristic and over-refined. I’m not sure what that last sentence means, actually, but thank you artpool.hu. This is an interactive environment containing music, videos, monologues, and art-jokes from performance artist and musician Laurie Anderson with the help of designer Hsin-Chien Huang. It begins with an electrical outlet that glows and howls into the darkness. Then you enter “The Hall of Time”, a corridor in the motel where icons cover the walls, and lead to 33 symbol-crowded rooms. A puppet Laurie Anderson sparingly appears as a guide. The surreal rooms include one full of exotic musical instruments from her performance-art career such as the “tape bow violin”. Clocks abound and floating telephone receivers on tree-like stiff cords, televisions showing static, and airplane kaleidoscopes. In one room with a maze of chairs, Anderson steps out waving flashlights like a runway attendant and recites the legend of Plato’s Cave – where prisoners are doomed never to see the true images of things but only to glimpse their fleeting shadows. In another room, she gives a long palm-reading session asking many questions of the player, and in yet another there is “The Amazing Ouija Floor Board” where you get to ask the questions. You must figure out what to do in each room, complete interactive art puzzles, and find how to exit. Throughout the game, your recorded voice and typed responses will be used and information from Anderson’s website will be downloaded including new videos and concert information. It’s recommended that you play the cd-rom while listening with headphones as small sounds and poetry flows back and forth from one ear to the other to impart a message. There’s ethereal music and Anderson whispers in your ear in a dark, soothing voice. Actually, part of what’s interesting about this is, it’s hard to describe Puppet Motel. It’s like someone trying to recount a dream. So thanks, Laurie and Hsin-Chien, for giving me this dream material and probably being one of the big reasons I wound up getting hooked on the computer as a medium.